The Studeblogger: Advanced Distributing for Studebakers. That little part above is, as you probably know, a vacuum advance canister (or "spark modifier" in Studebaker parlance" for a Delco distributor of the type used on Studebaker V8 Larks from 1960 to 1961. Although only used by the factory during those two years, the "window-type" Delco is prized by many Stude drivers because it's easy to rebuild, get parts for, and set point gap on, compared to the Prestolite units used on other years. As detailed in an earlier post, I obtained and rebuilt one of these Delcos, using a core graciously given to me by Warren Webb, one of the regulars on the Studebaker Drivers Club Forum. At the time I built it, however, I installed a vacuum advance specified for a 1961 Impala, figuring (wrongly) that a vacuum can is just a vacuum can. I should have known better! What I've found out since is that not all cans are equal. On this Forum thread, Joe Hall notes that the can commonly sold for Studebaker applications (NAPA VC680) is actually 2 degrees shy of the Studebaker OEM advance setting for V8 cars. It turns out that nearly all of these vacuum advance units are all manufactured by Dana Engine Controls, now owned by Standard Motor Products, so no matter what brand you buy, it's the same part in the box. The trick is determining the right part. And there are about 25 different cans, each with a different setting for the point at which full advance kicks in. So how do you identify them? Dana stamps a number on the mounting bracket of each advance unit. Each number corresponds to an advance profile that denotes how much vacuum must be applied to achieve full advance. It turns out, according to Joe Hall's research, that the Studebaker part number is "B20." The VC680 that NAPA's system specfies is "B1". Obviously the wrong part. Insufficient advance can be responsible for lost power and poor gas mileage - both of which my Barney has exhibited. So I started digging to find out what part number was correct for the Studebaker distributor. VC1765 turns out to be the correct Stude part. VC680 (stamped "B1") delivers 0 degrees of advance until 8" of vacuum, and 16 degrees of advance at 16" of vacuum. VC1765 (stamped "B20") deliver 0 degrees of advance until 6" of vacuum, and 16 of advance at 12" of vacuum. So I went to my friendly local NAPA and ordered a VC1765. Wisely, I checked the part before leaving the store - the wrong part was in the box, with a hand-written label that had another part number on it! Always check. Another part ordered, and this time it was correct - B20 stamped into the boss. 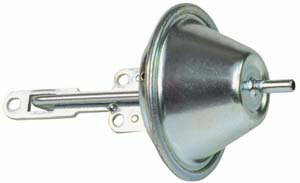 Replacement is easy, and doesn't require removing the distributor from the car. Just unplug the coil wire and undo the two spring-loaded screw clamps that hold the distributor cap on, and move it out of the way. The screws that hold the vacuum advance to the distributor base are accessible from the passenger side of the car once the cap is removed. As you can see in the photo above, there are two screws holding the advance unit on. Use a magnetized screwdriver to remove them, otherwise you'll be cussing as you remove the distributor to fish them out after you've dropped them! Also note that a lug attached to a wire that grounds the breaker plate is located under the screw at the end of the actuating rod - you'll need to replace it there after installing the new advance. After the screws are removed, pull the advance unit out; the actuating rod will then be able to rotate out of the hole in the breaker plate by pulling the advance body upward. Installation, as they say, is the reverse of removal. Once it's all back together, don't forget to check the timing and reset the idle if need be. For some interesting reading about vacuum advance, check out this post from the Vetteclub Forum, and the aforementioned paper from Lars Grimsrud. You'll find out everything you need to know and more! Very helpful. I just bought a vacuum advance from Northwestern Auto Parts in Grand Rapids, MI that they claimed was for the Studebaker Delco window-type application. When I received it, I tested it with a vacuum pump and the advance starts at 6 inches but does not reach the full advance until 14 inches. Is this far enough off that I should return it. What will be the effect of not achieving full advance until 16 inches--sluggishness and poor gas mileage. Yep, that's pretty much it, Stan. Bottom line: the correct parts are out there! Just be aware of what's what, and don't let your FLAPS pass off something that isn't right.